I recently encountered an issue with an existing CRM 2011 environment after installing Rollup 17. The deployment manager would crash with this following error. Type is not resolved for member ‘Microsoft.Crm.CrmSecurityException,Microsoft.Crm.Core, Version=5.0.0.0, Culture=neutral, PublicKeyToken=31bf3856ad364e35’. I turned on CRM tracing and this seems to be the underlying error. >Crm Exception: Message: Could not find AD entry for : 09283477 with SearchFilter: samAccountName, ErrorCode: -2147214038, InnerException: System.DirectoryServices.ActiveDirectory.ActiveDirectoryObjectNotFoundException: The specified domain does not exist or cannot be contacted. After much troubleshooting with CRM tracing, Netmon, LDAP Tracing and Wireshark I was able to ascertain that this exception is thrown right after Deployment Manager sends a NbtNs packet before crashing. I wrote a small console application to see if this could be a Domain Controller issue. There was no NbtNs packet sent out in my console application and it was successfully able to query the user details. There was also an additional issue I encountered when I tried to uninstall UR17. The uninstall process would crash with a owner_importlogs key violation on ImportLogBase table. 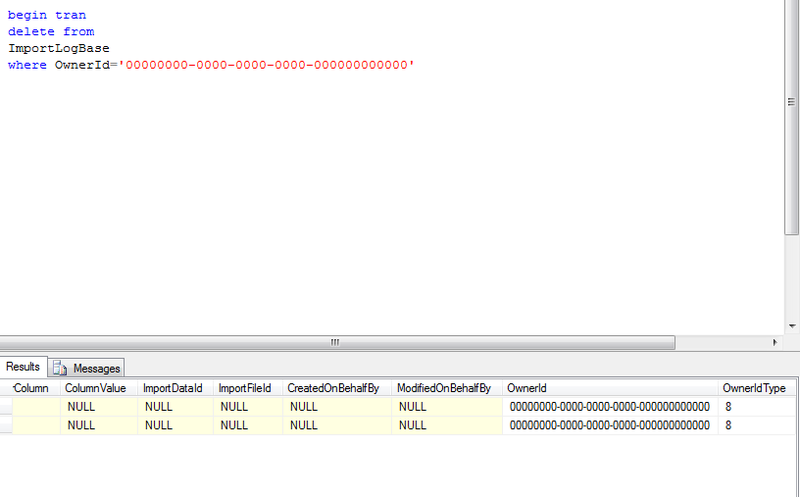 It seems the uninstall process wants to insert two rows with Owner Id = Guid.Empty in the ImportLogBase table. I had to disable this constraint, allow the uninstall process to finish and later delete these two rows. So if are having similar issues with Deployment Manager after installing UR17, downgrade to UR16 or wait for UR18.